Ashmore Park I.T. Limited is an established company formed in June 2007, based and serving the local community on Ashmore Park, Wednesfield, Wolverhampton, West Midlands, specialising in virus removal services. Nick Down, Managing Director, aims to provide a local I.T. computer shop for free advice and no obligation quotes to the general public, local businesses and anyone who needs some jargon free technical assistance! Ashmore Park I.T. is primarily a computer shop which stocks a small selection of computer parts for people to upgrade their own PCs but most parts we can get on a next day delivery service. We stock compatible ink cartridges for mainly Epson printers but can also get Kodak, HP, Lexmark, Canon, Dell and Brother printer cartridges to order. We can also provide ink toners for a variety of laser printers. In addition, we sell photo paper, paper for your printer and CD and DVD Media, keyboards, mice, memory sticks and a variety of cables and accessories. We are an AVG Internet Security distributor so any upgraded or new PCs purchased through our computer shop in Ashmore Park is eligible for software discounts cheaper than AVG online. Ashmore Park I.T. specialise in Laptop and PC / Computer Maintenance and PC Gaming Machines. We also repair any broken PCs or upgrade computers with better graphics cards, power supplies, bigger hard disk drives and memory (RAM - Random Access Memory). 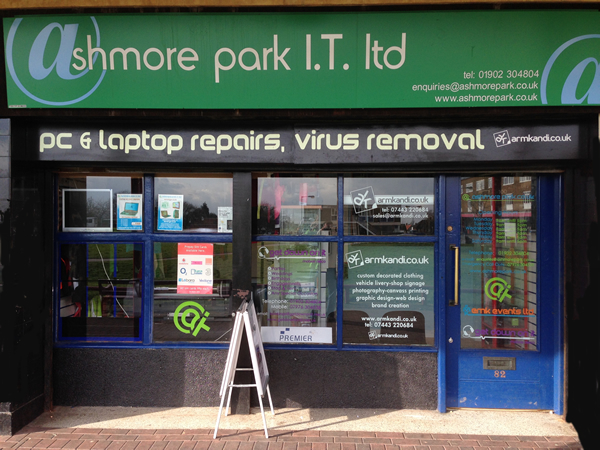 Ashmore Park I.T. have our own specialist laptop engineer who can fix damaged laptop power sockets, laptop screens and board level repair (where possible). We can also carry out laptop upgrades to increase memory or install bigger laptop hard disk drives. If you accidentally drop your laptop and it is beyond repair we can provide an insurance quote (for a small admin fee) as to the cost of repair. If this proves to be more expensive than a new laptop then you can claim on your house insurance. Ashmore Park I.T. can also provide Domain Name Registration, Website Hosting and Website Design. Starting your own business? Let us get you started with a unique domain name, hosting and four page website. Do you want to sell online, we can help with that as well! Come and see us for a no obligation quote! We offer one on one or group computer training lessons, tailored to your own requirements and levels of learning from basic to subject specific. If you wish to be computer trained from home then we do offer special family packages or one on one individual tuition to learn a variety of computer skills from basic training to specific packages such as Sage Accounts and Sage Payroll and all of the Microsoft Office Applications. Ashmore Park I.T. operate a callout system whereby we charge a one of fee of £40 to set-up laptops and PCs, wireless routers and home networking and software. All computer formats (computer wiping) and data backups are all done in-house. Ashmore Park I.T. offer CCTV Installations, Intruder Alarm Installations, Fire Alarm Installations, Electrical Contracting work as well as CCTV Monitoring Services. What we do and where we are. Please note our new Opening Times below – sometimes we may have to go on call outs and will not open until after 10:00am so please ring beforehand on 01902 304804 or 07976 3045038, thank you. Our opening times are flexible so if you would like an out of hours service or are running late to collect your system then just ring and ask on 01902 304804 and we will be happy to stay open or offer a delivery service if the need arises.